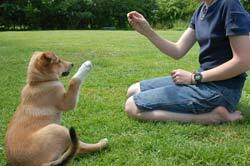 Dog training is extremely useful for teaching your canine how to follow simple commands. With the correct training, you can easily teach your pet all types of commands like to stay, heal, site and how to stop annoying barking. These tips will allow your pet to be a pleasant family and pack member with other dogs. The key principle of dog training is proper discipline. It is natural for dogs to interact with other dogs since, like humans, they are social creatures. Hence, when training them, you must speak with authority to let them know that you are the boss and they have to obey your commands. Putting your dog under training is very beneficial but to be able to train it properly, you have to learn the basics of dog training. This can be hard at the start especially when you are going to train a dog for the first time but once you grasp the main ideas of it, you will find it easier and more enjoyable. Proper dog training is of primary importance since training your dog improperly can result to a worse dog behavior. So, what is the right way of training a dog? The answer to this is through rewards and punishments system. This is very simple and has been found to be a really effective method especially when training puppies. Most people suggest that you start training your dogs while they are still young because it will be harder for them to obey you once they are already old. The principle of the rewards and punishment system is that you have to give your dog something it likes such as dog biscuits once it has obeyed you but punish them if they have done something bad. The environment where you are conducting the training is also a factor. Carry the training out in a place where your dog will not be distracted by noise or by other people. This way, it will concentrate more on following your commands. You also have to execute every command with authority and consistency to address to your dog that you are not playing with him. Make sure that every punishment is given once your dog has behaved badly but be careful not to overdo it. Some dogs response positively to punishments while others do not. A dog that has been properly trained by its owner will exhibit good attitude towards its owner, other people, and other dogs. Thus, dog training is necessary in keeping your dog well-behaved and an important member of the community.